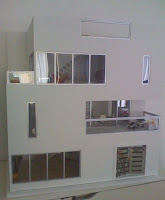 Remember that new modern dollhouse that I mentioned before? Well, here are a few preliminary images of that structure (First image [L] = front, second image [R] = back). 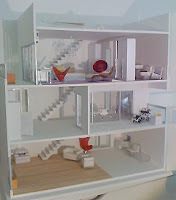 This 1:12 dollhouse kit is called Clearview House and is the first of many designs to come from this new modern dollhouse company based in the UK. 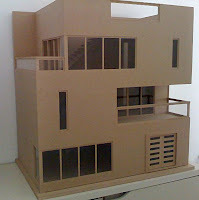 I'm a fan of the generous glazing, flexible spaces and balconies that contribute to this modern dollhouse design. 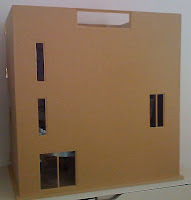 Anyone interested in more details or wanting to purchase this dollhouse, should contact Miaim Miniature Design & Architecture: eyshaw@talktalk.net or via their website:www.miaim.co.uk (which launches in late November 2008). Thanks for sharing and finally relieving me of my agonies =) It's really a great house to play around with. I have no dollhouse building experience but I think it doesn't look like it's too difficult to put together. Wait, let me wipe my drool. What a find! I think I know what Santa will be delivering for Christmas this year. Absolutely fabulous!!! Well worth the wait. It make me think of Miami Vice (in a good way). It looks much larger than the dimensions indicate. Can't wait to get one of my own!! I was trying to buy it but it seems like you only can order it to an English or an US address. I've emailed them about it. I'll be sad if I can't get this house when I finally find a house I like and can afford. Hi MC - Elaine at Miaim has told me that another Clearview will go up on Ebay this coming Sunday for a week. I checked on shipping to the US, and she has quoted it at $171. Steep! Yes, it is unfortunate but normal for the shipping to be so high coming from the UK. However, I don't know how the DHE keeps their shipping so low. Hmm...anyway, I imagine the Clearview house is really heavy and so the extra charges. It was a bear to get the 2 Voila Large dollhouses shipped from overseas but if you want something---you're usually willing to pay for it and then your wallet cries.